Today's Draw: The Star from the Nigel Jackson Tarot. Are you doing what you want to do with your life? What was your childhood dream? Why did you let go of that and what do you secretly wish you could be doing now? We've recently gotten The Star. This is one of those "beloved" cards of the tarot. It speaks of hope and optimism and wonder. Most tarot readers have a certain card they always look at in a new deck to help them decide whether to buy it or not. The Star is one of those cards for me. 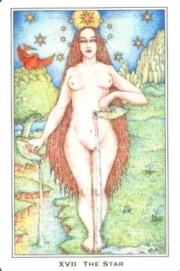 It usually looks something like this card, with a woman pouring out two jugs of water. The waters symbolize the flow of emotions, both those we consciously feel and those that are hidden even from us. The waters are pure and healing. And there's usually a bird, symbolizing the flight of soul. In this particular card, the bird looks like a phoenix, which symbolizes rising from the depths and overcoming. What it all boils down to is something we've been touching on all week—following our own North Star. You could say I've been fortunate in my life that I've never had to make a decision with anyone else in mind. It's not really "fortunate". I've set it up that way. No husband to consider. No children to consider. And, for one reason or another, I never felt sufficiently required to make any decisions to make my parents happy when growing up. Not that they didn't have their opinions. Just that I never felt obliged to listen to them. My mother died before I graduated college and my father wasn't happy with my choice of life direction, but somehow, somewhere inside me, I always knew this was MY life to live. And I've always been strong enough to stand my ground. I know not everyone has been able to manage that in their lives. Further, I knew before I graduated high school that I wanted to be an advertising copywriter. Many of the people I went to college with, frankly, still don't know what they want to do with their lives. Again, you could say I'm fortunate, but I think what it comes down to is listening to that voice within. My father didn't support my pursuit of a career in marketing. As a child of the Depression, he didn't trust advertising. Also, go to any good advertising school and they'll do everything they can to steer you away from being a writer. In an advertising agency of maybe 45 people, you'll find two writers. Which means there's more EVERYTHING in advertising than writers. The odds are just slim of making it. And it took me years of doing all sorts of other crap in the advertising field to become a writer. But I didn't give up. The point of this is not to talk about how wonderful I am (but if you insist on believing that, I won't stand in your way). Rather the point is to illustrate some of the key things needed to follow your own North Star. The first thing is to listen to that voice within that tells you where your passions lie. It's not that you've never heard that voice. It's that you've discounted it. You've told yourself, "I won't make enough money as a dancer." "I'm not smart enough to become a lawyer. ""I'll never make it as a folklorist. ""I don't have the personality for sales." "There's no future in social work." "I can't afford to risk going out on my own." Whatever it is or was that your North Star told you, you've probably talked yourself out of it. Go back and excavate to see what it was. Better yet, ask yourself right now, "if money or time or "reality" weren't an issue, what would you be doing right now?" And also, ask yourself if what you've done for money so far in your life has made you happy. I believe that if you follow your dream, the means will come. But when it becomes about money, it takes the soul out of it. More on this later. The second thing is that, when you have a dream—especially if it's a dream that's quite different from where you are now—be VERY careful of who you tell it to. In fact, keep it to yourself if you can. In general, people are afraid of reaching out for their own star. And they will transfer that fear on to you if you tell them your dream. They won't crush your dream on purpose. They'll just place their own fears on your dream. Look, you know that if you're a 50 year old, out of shape man, you won't make the NFL draft. But most things are achievable. Another part of this is that they'll place their own limitations on you. I can't remember how many people told me how hard it would be to get a book contract, that it's not that easy, blah, blah. And I got not one, but two, on my first try. If I had listened to them and believed them, that would limit my prospects. You can't drink in other peoples' fears and realities. You have to believe in your dream and yourself and protect both from naysayers. Third is also a two-parter. Don't take "no" for an answer. And keep your mind open. I worked in advertising NOT as a writer for three years. During that time, I repeatedly tried to get freelance work and find a way for me to help the writers on staff. I ended up then taking two writing jobs that weren't what I wanted to do. It was 7 years before I got the job I wanted. Keeping my mind open, though, got me skills along the way that would help me when I finally got the job I wanted. Over time, I also came across people who found something else they loved by going for the thing they *thought* they wanted. Here's the thing, if you really do love something, it doesn't matter what level you do it at. What matters is that you're doing it. An actress doesn't have to be Meryl Streep to have a fulfilling career as an actress. If you really love acting, it doesn't matter whether you do it on the silver screen or the community theater stage. Personally, I think anytime you go for money or fame, you'll screw yourself out of happiness. Not that rich famous people can't be happy. They can. But they usually get there by loving what they do. The final thing is, keep checking in. Your North Star can change. Don't pursue something simply because you've invested in it. Your investment will never be lost. It may pay off in ways you can't yet imagine. Something that once brought you joy may cease doing so. I'm transitioning my own career right now. Slowly and instinctively. I don't believe that the direction I'm going in now is my ultimate direction, but I do believe it's a direction that's going to take me where I want to go. Truth: As much as I've loved my career to this point, it hasn't been a joy every single day. I have no idea who these people are who say, "I wake up every morning with a spring in my step and just can't wait to get to work". I think they're full of crap. But I know there's nothing I'd rather have done for 25 years. There's nothing else I could have been passionate, enthusiastic and focused upon for so long. And it's not like I'm even that good at it. That's not a requirement. But I know I couldn't have put up with a career this stressful with the added stress of hating my job. I also don't think my personal life would be as satisfying if I didn't like my career. As a single, childless person (happily) my career has been a focus in my life, so it's important. But the same ideas apply to any course of being you want to pursue, whether it's a hobby, lifestyle or other choice. This week we've had three cards, all focused on finding parts of yourself...your spirit, your soul and your calling. We have these ideals that any and all of these paths will lead to Elysium. And we really cheat ourselves out of a lot of happiness with expectations like that. We can't be happy all the time. It can't be easy all the time. It can't be deep and profound all the time. And no single path can be "enough" all the time. Nor can any of it make up for the parts of you that are missing. But if you are in it in the right spirit, you can't lose. Because just going for it is a gift in and of itself. There is no magic wand in life and anyone who tells you differently is full of crap. BUT we're here. We're free. Why not grab for as much of it as we can? Why not live our lives going full throttle for the things that excite us and make us smile. Screw what others think. As long as you're not breaking any laws, where's the harm? True, you can't get there without risks, and maybe safety is your North Star, but isn't doing what you came here to do worth a risk?